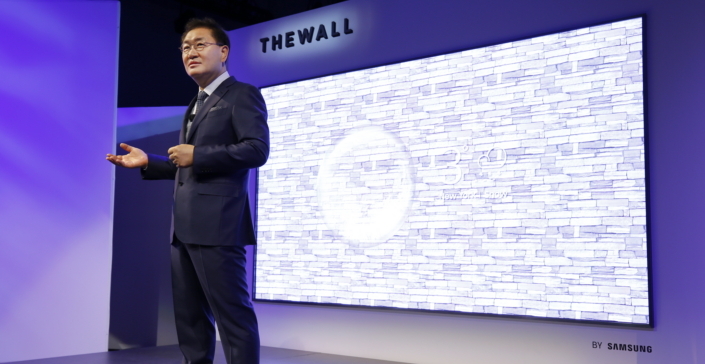 Samsung Electronics today introduced “The Wall” – the world’s first consumer modular MicroLED 146-inch TV – at its annual First Look CES event. The modular, self-emitting MicroLED 146” TV display was featured alongside Samsung’s latest innovations in display technology, demonstrating how television is evolving to offer consumers an outstanding viewing experience, while acting as a centralized connected smart hub to enhance everyday life. This year’s First Look, attended by more than 300 global media and influencers, included remarks from Jonghee Han, Samsung’s President of Visual Display, and Dave Das, Senior Vice President of Consumer Electronics at Samsung Electronics America. Both outlined Samsung’s vision of the future – one in which TV displays deliver brilliant visuals and also evolve to integrate seamlessly into people’s lives. 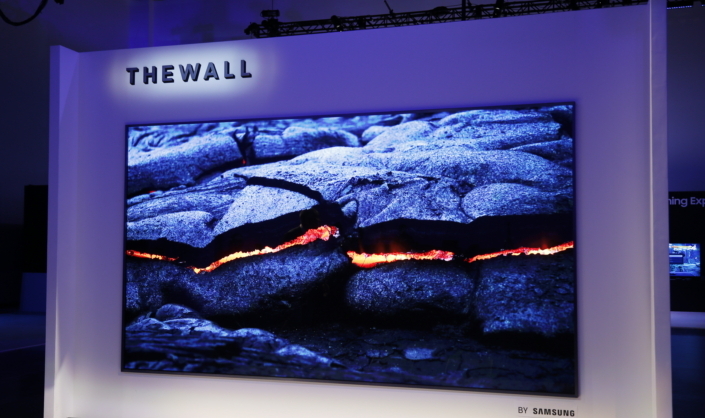 Samsung’s “The Wall,” a 146-inch modular TV with MicroLED technology delivers incredible definition, without restrictions to size, resolution or form. It is a self-emitting TV with micrometer (µm) scale LEDs – which are much smaller than current LEDs, and serve as their own source of light. The MicroLED technology featured in The Wall eliminates the need for color filters or backlight, yet allows the screen to offer consumers the ultimate viewing experience. Also, the MicroLED screen excels in durability and effectiveness, including luminous efficiency, the light source lifetime and power consumption, setting the standard for future screen technology. Featuring a module-based, bezel-less design, “The Wall” also exemplifies how consumers can customize their television sizes and shapes to suit their needs. The screen can adapt to serve different purposes, such as creating a wall-size display for multiple spaces. Samsung also featured the world’s first QLED TV featuring 8K AI technology, which will be launched internationally, starting with Korea and the US during the second half of 2018. This AI technology upscales standard definition content to 8K resolution. It employs a proprietary algorithm to adjust screen resolution based on picture quality characteristics of each scene, to continuously improve picture quality and easily transform any type of content from any source into a high-resolution 8K. This 8K solution maximizes the viewing experience through several new features. These include detail enhancement – to upgrade standard definition content; noise reduction; edge restoration function – which more clearly outlines on – screen objects; and automatic sound adjustment for different content, such as sports events or music concerts. Samsung showcased 2018 Samsung Smart TV’s enhanced connection and convenience functions at the First Look event, including Bixby, SmartThings and Universal Guide. Bixby is an intelligent assistant platform developed by Samsung, enables easier interaction between the TV and its users, thanks to its intuitive UX, and comprehensive voice analysis capabilities. 2018 Samsung Smart TVs will also offer easier sharing and connectivity, thanks to SmartThings, Samsung’s IoT platform hub. It offers a simpler way to control the television and sync with other devices. 2018 will also see the launch of Universal Guide – an advanced program guide which automatically recommends TV programs and content according to a user’s preferences. First Look also highlighted a variety of product zones, showcasing 8K-AI technology, 4K HDR Gaming, HDR10+, Smart TV experience and more. These areas gave guests at First Look 2018 the chance to get hands-on Samsung’s most exciting innovations in TV. For more information on the latest innovations in television from Samsung, please visit Samsung’s CES booth #15006, on Level 1 of the Central Hall in the Las Vegas Convention Center from January 9-12, 2018.